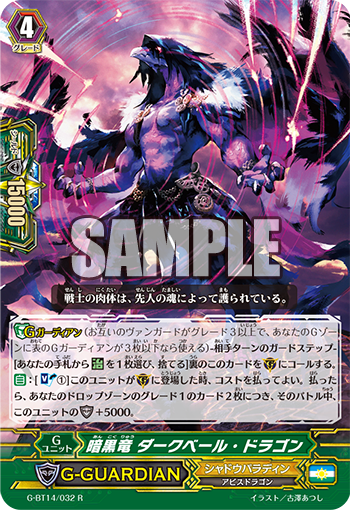 Introducing Shadow Paladin’s newest G-Guard and Grade 2. AUTO [Soul Blast 1] When this unit is placed on (GC) you may pay the cost. If you do, for every two grade 1s in your drop zone, this unit gets Shield+5000. AUTO (RC) Ritual 3 When your other grade 1 unit is placed on (RC), if you have a vanguard with the Ritual ability, that unit and this unit get Power+3000. 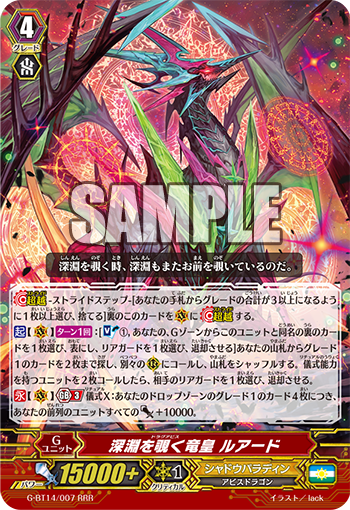 CONT [Deck/Drop Zone] If you have a grade 4 vanguard with “Luard” in its card name, this unit gets grade-1.